Magicard Printers are known for their built in security features like HoloKote overlaminate technology. 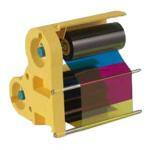 Magicard Color Ribbons are specially calibrated for Magicard Printers Single or Dual Sided. All genuine Magicard ID Card Color Ribbons print true color images on the ID Cards and make for more professional looking ID Cards. IDSecurityOnline stock all Magicard Color Ribbons for all Magicard ID Card Printers.